Pretty much everybody has a friend from their college days who was a smoker. A typical college guy, he would stylishly pull a Wills cigarette, fix between his teeth half-biting it, take out a "cheetah" match-stick, almost bringing it towards the cigarette, but slightly bending the neck to reach it, protect it from the winds with the other hand, light the cigarette, all the while making some unintelligible sentences with cigarette in half-open mouth and finally looking up the sky, let out a satisfactory smoke and a sigh, with thoughts lost in a philosophical world. He also would oblige his friends, by letting out "rings". Smoky Rings, especially let out in incremental diameters and one following another in perfectly equal time intervals, was considered the ultimate accomplishment in smoking. The first time when I came across the text of Meghadhutam, The Cloud Messenger, it was bewildering, to say the least. The loooong shlokas in the mandakraantaa meter (17x4=68 syllables) seemed to have an unhurried pace of its own. The meaning had to be understood from English translations, which painted the idea, but not quite the subtlety. Later I started doing anvaya-s of the shlokas. anvaya-s are exactly like solving jigsaw puzzles. You already know what the final picture is (ie the translated meaning) but the challenge is in getting there: find the most important piece - the dhaatu, group similar vibhakti-s, figure out the kaaraka-s, fill-in the avyaya-s and suddenly a sense appears out of nowhere. The pleasure of anvaya is magnitudes above the pleasure of just reading the translation. Even the harshest critics of Kalidasa (if any) agree that Meghadhutam is one of the finest and most original works of human mind. It has influenced several poets, both Samskritam and non-Samskritam. Poets have imagined a variety of messengers for whatever purposes. Venetia Asnell blogs that there are about 70 known-so-far messenger-poems in Samskritam alone. Literary gems like Hamsa sandesha, Kokila sandesha being aside, there are also poets who use this technique for ninda-stuti. One poet took it to a new level and composed "Donkey Messenger" (kazhudai-vidu-thoodu, கழுதை-விடு-தூது, in Tamil) to disgrace another poet. In olden days, smoking was not known to be injurious to health. There was a poet with a pen name "seeni sakkarai pulavar" (funny name, because both seeni and sakkarai mean sugar in different Tamil dialects). It is known that he was born in the family of great poets in Ramanathapuram district. Being a great bhakta of Subrahmanya, he imagines a lady sending the cigarette smoke as a messenger to Subrahmanya in his புகையிலை விடு தூது ("pugaiyilai viDu thoodu", tobacco-smoke-messenger). Out of 59 verses, 53 praise the cigarette and the last 6 contains a message to Subrahmanya svaami of Pazhani (Balasubrahamanya). O Cigarette! Whats the trick that you make even the scholars slave to you? Can the good smell of Kadamba powders match the smell of yours kept in a jar? In the course of praising cigarettes, the poet also Indianizes the history of tobacco, giving it an interesting puranic twist. 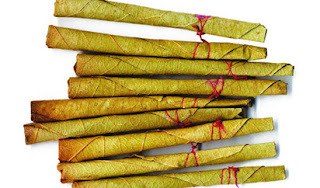 Once the gods gave a bilva leaf, tulasi leaf and tobacco leaf to Shiva, Vishnu and Brahma respectively and asked them to bring it the next day. The cigarette mentioned here is not the modern filtered cigarette, but the local bidi aka suruttu, which is made with tobacco leaf. The vilva leaf was taken away by Ganga (residing on Shiva's jaTa). Tulasi leaf was taken away by the milk ocean (where Vishnu resides). Smart Brahma had given the tobacco leaf to Sarasvati who resides in his tongue. The next day the gods ask the leaves back, while Shiva and Vishnu could not return, Brahma says மற்றவர்கள் பத்திரங்கள் போயின, என்னுடையது போகயிலை ("mattravargal patthirangal poyina, ennudaiyadu pogayilai, others' leaves are lost, mine is not lost), takes it from his tongue and returns. The poet plays on the word "போகயிலை" ("pOgayilai", not lost) which later morphed into புகையிலை ("pugayilai", tobacco). With the story having strong references to purana-s and also a tight etymological derivation, anyone would hardly dispute its origin! If only this poem had been taught in schools, the smoke rings from those college friends would have served as a more meaningful messenger! The full text in tamil can be downloaded here. भवतः अन्वयानां ध्वनिमुद्रिकाभिः प्रसारणं अस्मद्धर्षाय (<- सन्धिः सम्यगस्ति वा?) अभविष्यत्!